Home / Self improvement / Is Bacon bad for your health? There can be no doubt that bacon should not be considered a healthy food. 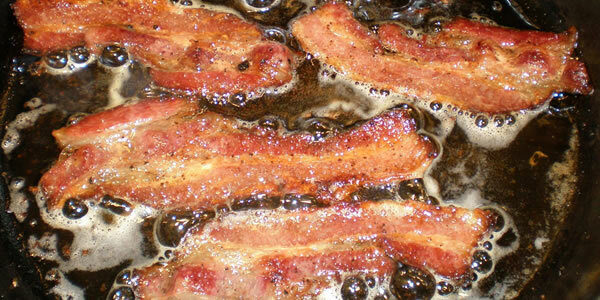 In fact, it is usually obvious by the layer of grease that is generated by any food containing bacon, or the amount of fat in the pan when it is cooking, that probably isn’t going to be that good for you. Why is bacon so unhealthy? Bacon is high in fat, of the particularly unhealthy saturated type, cholesterol, calories and salt. All of which are thought to be contributing factors to lifestyle diseases such as heart disease and obesity when consumed in excess. Bacon is also classed as a processed meat, along with foods like salami, sausages and pastrami and has therefore been linked to increased risk of certain cancers in recent research. There is also a possibility that other carcinogenic compounds known as PAH (polycyclic aromatic hydrocarbons), may be created during the processing of these types of meats, including bacon. A high consumption of processed meat has been linked to an increased risk of prostate and other cancers. A recent study carried out in Switzerland involving nearly 450,000 participants found an association with processed meat intake and increased risk of dying. In fact those that ate the most processed meat were said to have increased their risk of dying early by as much as 44%. Processed meat was particularly associated with heart disease and cancer. The findings have led researchers to recommended limiting process meats to less than an ounce per day, as this is the level they believe will limit risk. This study only showed an association and could not give a reason why this might be the case, so further research is needed to investigate possible causes. However, many other past studies have associated meat intake with higher risk of various diseases such as heart disease and some cancers, although it is not always clear if this is due to the meat itself or the fact that those who eat more meat tend to eat less plants and plant based foods as well. Although bacon is not a healthy food, in small doses it can probably still be part of an overall healthy diet. If bacon is the only processed meat you eat, you diet is otherwise healthy and you eat it only on occasion and in small quantities, there is no reason why a small amount of bacon should not be part of a healthy diet. Using smaller quantities of bacon, such as small pieces in a pasta dish to give flavour, is a good way to get that bacon taste. For example, an omelette made with vegetables and small pieces of bacon is probably going to be a healthier alternative to a few fried bacon rashers with eggs, as you will eat less, but you will still get that bacon and egg flavour. Leaner cuts of bacon are also a better alternative, for example middle bacon tends to have a lot less fat than streaky varieties and it may be possible to remove a little of the extra fat from the outside of these types too. There are also numerous low fat, lower salt bacon alternatives which may offer a healthier option, however, for many people they are lacking the true taste and flavour that makes bacon so attractive in the first place. If this is the case for you, you are probably better off using real bacon but in smaller quantities and less often. How about giving Turkey bacon a try? Turkey bacon is another option which will give a reduced amount of calories and fat. If you can find one that has a good flavour and satisfies your bacon cravings, this could be a good alternative. It should be noted however that this is still a processed meat, and whilst it may have less calories and fat, it might still contribute to increased risk of other diseases. Different cooking methods can also make bacon slightly healthier, for example grilling and letting excess fat fall into the drip tray rather than frying. If you do fry your bacon, tip away and excess fat in the pan before serving and pat the rashers with kitchen paper to absorb any extra fat that you can. There are also many organic, nitrate free, less processed varieties of bacon appearing on the market. These may or may not be a healthier alternative, as it is still unclear what factors contribute to the association between processed meats and increased risk of diseases such as cancer. It may be that by making bacon in a more natural way, this risk will be reduced; however more research is needed to say definitely if this is the case. For true bacon lovers, the bottom line is try to make bacon a treat in your diet and focus on following a healthy diet rich in fruit, vegetables, lean protein and low GI carbohydrates the majority of the time to allow for the odd indulgence.